TARA KLamp is a Malaysian invention developed by Dr. Gurchran Singh in the 80’s. It went on to become the premier circumcision device and was first marketed in 1995. It is highly regarded in SE Asia and in Africa and its currently making its foray into the sub-saharan market. Gurch as he is fondly known earned the Malaysian Medical Association’s Outstanding Public and Healthcare Service Award, as a result of his tireless efforts in promoting safe circumcision as the product has been granted patents in numerous countries.TARA KLamp, is the the only circumcision device that has been listed under Circumcision Devices in the UMDNS. Taramedic Corp was formed in 1996, as the first Non Invasive global enterprise with subsidiaries all over the world. We've been fortunate to play a role in helping millions of people combat against HIV/AIDS and other cross-infectious diseases. 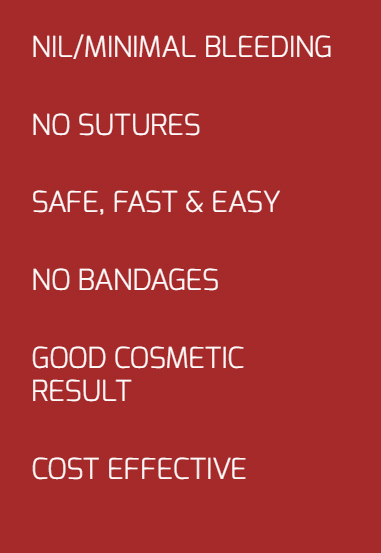 It’s continuous effort to provide solutions for safer circumcision with a scalable and affordable cost as the product guarantees customer satisfaction. ECRI, (www.ecri.org), formerly a collaborating canter for WHO and accredited by W.H.O for evaluation of medical devices, declared the Tara KLamp as ‘ACCEPTABLE’ and has given a Code which needs to be displayed on all packs of Tara KLamp. TARA KLamp is the only circumcision device declared Acceptable. 2.) Has been given a UMDNS CODE, which needs to be displayed on all labels, packing and literature of the Tara KLamp device. UMDNS is the baseline system for the Global Medical Device Harmonisation Project and is in use internationally for medical device classification and registration purposes by regulatory agencies. The European UNION (EU) has adopted UMDNS as a standard. Widely in use throughout the international healthcare community, UMDNS is a requirement in several countries including Australia and Germany. This recognition provides product information to key purchasing decision makers, worldwide.